Both of these options are great choices! You just have to look at your options and decide what works best for you. As we all know, there are hundreds of hardwood flooring options out there. Different species, colors, hardness levels, finishes, and more combine to create the perfect look no matter what your design choices are. One of the choices you can make for your home’s hardwood flooring is to choose pre-finished wood, or planks that are finished on-site. Both of these options are great choices! You just have to look at your options and decide what works best for you. One of the biggest reasons homeowners choose pre-finished flooring is because it takes so little time to install. All of the treating and processing is done by the manufacturer. All the installer needs to do is nail or glue it down. This cuts down on installation time as well as costs. 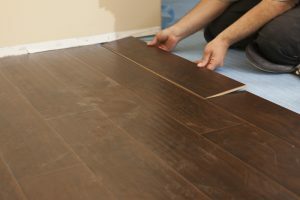 When flooring is finished on-site, the unfinished boards have to be installed, sanded, then finished. Once the final coat of finish is applied, the floor cannot be walked on until it is totally dry. Some homeowners view this as an inconvenience, but many believe it is worth the wait! When hardwood is pre-finished in a factory, it is coated with several coats of aluminum oxide. This coating is strong and tough. Site finished flooring will give you a flat, smooth finish because the boards are laid down before finish is applied. With pre-finished planks, the lines where planks join will be more defined. It is important to remember that the grade of the wood is what determines the depths of the colors and the grain patterns in your floors, not necessarily the finish. Your hardwood flooring is going to be with you for years to come no matter which type you decide on. Pre-finished and site finished flooring choices both have their own unique qualities. Talk to the professionals at Jason Brown Wood Floors to help you choose the perfect hardwood flooring for your home. This entry was posted on Thursday, February 15th, 2018 at 1:10 pm. Both comments and pings are currently closed.